Upper Floor: Master bedroom with king size bed, LCD TV and DVD/VCR, full ensuite bathroom with Jacuzzi Tub. Main Floor: ~Living room: lovely leather couches, fireplace, Cable TV, VCR, DVD, and surround sound with subwoofer. ~Dining area accommodates 8 around a wood table with 2 additional bar seats facing the kitchen. ~Kitchen: fridge, oven, microwave, blender, toaster, coffee machine, dishwasher, pots, pans, dishes, utensils, etc. ~Main floor has access to a one car garage, and a well appointed powder room. ~Hot Tub with views of the surrounding mountains. Lower Floor: ~First bedroom has queen size bed and LCD TV/DVD combo and a private full bathroom with shower. ~Second bedroom can sleep 4 people either in 2 single beds and 1 set of adult bunk beds or in 2 sets of adult bunk beds with LCD TV/DVD combo. ~Third bedroom has one double bed witha single bed on top LCD TV/DVD combo. These two bedrooms share a full bathroom with tub and shower. ~The laundry washer/dryer is also located on the lower floor. Perfect for a long weekend stay for our large family. 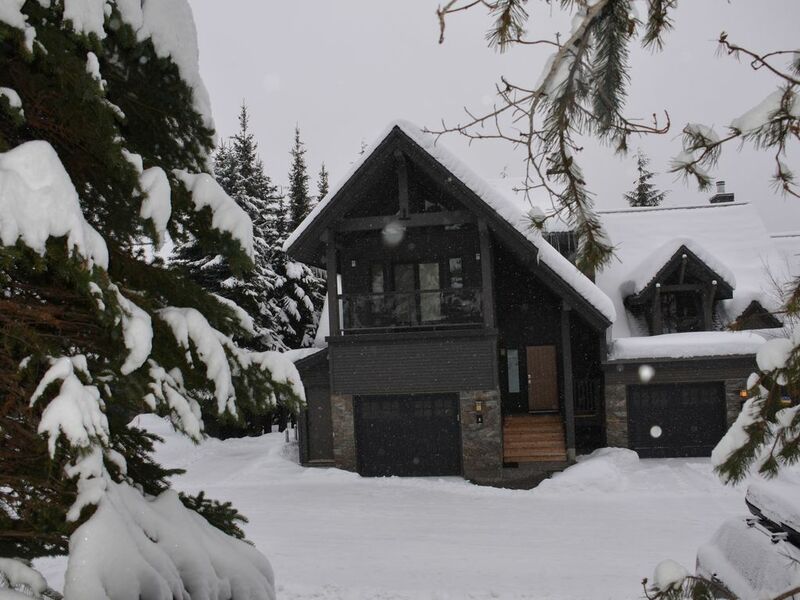 Comfortable communal space and the location, even without snow, provides easy access to Whistler Village. Well located, spacious and modern. Great place with large rooms and great living areas. Everything was thought of. We stayed for a long weekend and referred to the place as our 'nest in the trees'. The townhouse is gorgeous, with a spacious common area, modern updates and an extremely comfortable layout. Bunk beds make it possible to accomodate room and a sleeping spot for everyone. It was the shortest walk to town ever, but keep in mind you are walking down the ski mountain, so it's a dirt and gravel walk way. The owners were very responsive to our questions which was nice. One thing to note is that the garage spot is a bit tight and even our small SUV did not fit, but there was a parking pass and other designated spots to use. I can't wait to come back during the winter, because the access to the hill in terms of ski in/ski out is pretty unreal! What a way to start 2016! This property was everything it promised. We had a family of 4 adults and 6 children (6-14yrs). The property accommodated us very well and we never felt cramped at all. The master suite was amazing and the bed so very comfortable. With all the mod cons it was a dream house. The children were all snug in the bunk rooms and the downstairs bedroom with an ensuite meant both sets of parents could have their own bathrooms. The kitchen, dining room and lounge areas were great. Huge table so we could all eat dinner together. We cooked most of our meals at home and the kitchen was perfect and spacious. As promised they provided things like blenders and slow cookers and even went out and got us a sandwich press when requested. There is even a BBQ - never BBQ'ed in the snow before! The spa was a great thing to come home to after a day on the slopes. It was quite magical having a nice relaxing drink in the spa with the surrounding trees covered in snow! The garage/drying room was fantastic. We did not have a car so we used this area to our advantage and easily fit 10 people and their "ski gear" comfortably. Even going to length to have stools to sit on to put your boots on - they have thought of it all. Boot and glove warmer worked well and with hooks, shelves and racks everywhere we got into a nice "get ready routine". The coded entry meant anyone could come home at anytime of the day. Location was perfect. Literally a minutes walk from your front door to the slope. From here you could see the village and it was a very short ski to the main Whistler Gondola area. From here you could take the Gondola or chairlift up Whistler or the Gondola up Blackcomb. To get back home at the end of the day it was as simple as skiing back into the village if you were on Whistler mountain and catching the Gondola up Blackcomb to the first stop and then skiing 2 mins back down Village Run and taking a right turn into your street. Unclipping and walking 1 minute and you were home. MAGIC!! There was a shuttle that went from the village past our street but we never got it. It was a beautiful walk down the slope into the village at night time and a 10 minute walk back up the hill after dinner. The village is AMAZING - so much to do and see and lots of places to drink, eat and be merry. We did have a few issues with hot water and underfloor heating in the 2nd ensuite but the cleaner/maintenance lady was so very helpful. shopping, canoeing, fishing and much more.